What does Halcion addiction treatment consist of? The first step towards recovery from Halcion addiction is to admit that you’re struggling with Halcion dependence. Before admission to a treatment program or a rehab, they will conduct various assessments and interviews to evaluate the addiction severity index. Detox is the next step. Counseling and aftercare are crucial to prevent relapse and guarantee a happy life. What rehabs can I find for my Halcion addiction? Individuals addicted to Halcion can choose from various treatment options. One might need detox, and in severe cases of insomnia, doctors will administer additional medication. One can choose from outpatient and inpatient care centers. Furthermore, one can find a luxury rehab where experts provide a more personal treatment. Behavioral therapy, holistic approaches, and aftercare are crucial for the successful treatment of Halcion addiction. 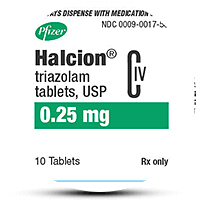 Halcion or Triazolam is a type of benzo. Doctors use it for the treatment of severe insomnia. By depressing the central nervous system, the drug leads to drowsiness and sedation. Halcion is a potent drug. In fact, it was among the most prescribed sleeping pills in the 90s. However, Triazolam can lead to addiction that may require serious treatment. Although Halcion is a prescription drug, as mentioned above, it can lead to tolerance and dependence. When one uses the drug for more than few weeks, its effects can diminish and actually. Actually, it can worsen insomnia. When a drug doesn’t improve someone’s symptoms, that’s an indication of other psychical and mental disorders. As a result, you should address them as the primary cause of the treated symptoms. Many patients will increase their Triazolam intake due to high tolerance. They also do this because they are unable to cope with some withdrawal symptoms. They include vomiting, tremors, and rebound insomnia, continue abusing the drug. Some people abuse the drug due to its recreational value. Halcion can lead to euphoria and relaxation. These states of mind can be very tempting for a lot of people. Whatever the reason behind the Halcion abuse is, it’s a fact that the drug can lead to some severe side effects. They include nausea, slurred speech, amnesia, confusion, and tiredness. One of the most serious consequences is developing an addiction. Some of the factors that can contribute to Halcion addiction are a previous history of abuse and polydrug use. Above all, it’s crucial to spot and treat Triazolam addiction because abuse can lead to overdose, fatal accidents, and death. In the case of an overdose, call 911. People can use drugs like Flumazenil as an antidote and save a life. In addition, spotting Triazolam dependence can prevent health problems, social isolation, bankruptcy, and even death. Therefore, seek help and explore treatment options as soon as possible. Are you (or someone you love) taking too much of the drug? Do they have legal problems due to Halcion abuse? Are they going doctor shopping? Maybe all your thoughts are around obtaining and taking Triazolam. Then, you might have to admit that you’re struggling with Halcion addiction. Halcion addiction treatment is crucial. The very first step in the recovery process is to admit you have a problem and encouraging your loved one to face the consequences of their addiction. Before admission into a treatment program, they will conduct assessments and interviews to get to know the patient. Afterwards, they will create the best plan for their recovery. Detox is the next step in the treatment process. It can last up to several days or even weeks. Many rehabilitation facilities offer help for Triazolam addiction. A patient can choose from two the main options. They are outpatient or inpatient rehabs. Inpatient centers are a great option for people who need constant monitoring and medical help. People can find different programs that last one, two, three, or six months. In addition, medical assistance is available for people who are dealing with different conditions. They include severe inbound insomnia, pain, or other comorbid disorders. Also, people who are struggling with Halcion addiction can choose a rehab next to their homes. However, if they think that visitors and emotional triggers can lead to relapse, they can have rehab far from their home. Outpatient rehabs offer more freedom because they give you the chance to continue performing everyday tasks while dealing with Halcion addiction. Counseling and behavioral therapy are central components of a successful recovery process. Any addiction requires an in-depth exploration of emotions, traumas, and self-worth. In addition, many facilities offer a luxury stay with great amenities. They include a gym, individual programs and spa procedures that make the recovery a desired process. In some Halcion addiction treatment centers, you can use your insurance to cover some of the expenses. Like any other substance, Halcion may lead to cravings and risks of relapse. Therefore, aftercare can be as important as detox and therapy. Some support groups and religious centers can provide the emotional support the person addicted to Halcion needs. This way, they will be able to lead a sober life. In many places, holistic approaches like yoga are becoming more and more popular. Are you and your loved ones looking for a rehab facility? Here, you can find one that will suit your needs and help you lead a healthy life. Do not worry so much. A Halcion addiction treatment might be the answer you are looking for.